Last Friday morning, just as markets were set for a powerful bounce after the biggest two-day drop since February, JPM's head quant Marko Kolanovic predicted that the recent selling pressure, which had come from option gamma hedging, was ending and noted that since "equity indices already experienced comparable declines to February (and e.g. Russell 2000 even a bigger drawdown), we think that the current setup favors buying the dip." In light of the sharp rebound last Friday, and the even sharper bounce this past Tuesday, Kolanovic was accurate with his forecast, even though Thursday's just as sharp selloff put in question whether the systematic selling - or option hedging- was indeed over. [W]e saw Monday US morning weakness, a large Tuesday rally and end of the day squeeze, a Wednesday US morning reversal, and yesterday acceleration on the downside – all significantly driven by dynamic hedging of index options. A similar impact was registered each day around the European close (11:30AM EST) driven by dynamic hedging of European portfolios. 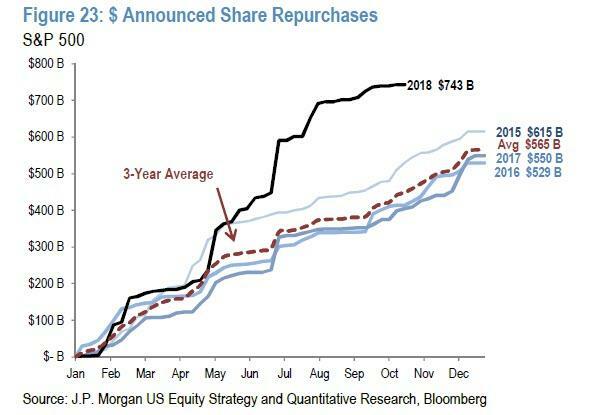 Meanwhile, since his note Friday, the market is up 1.5% overall, confirming that "so far systematic outflows were balanced by inflows from fundamental buyers, fixed weight rebalances, and ASRs." 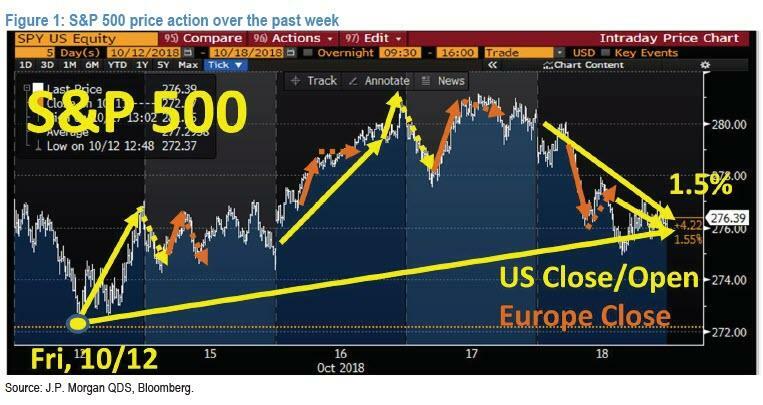 Kolanovic shows all these moves in the chart below starting from last Friday (yellow dashed lines indicate reversion of hedging impact around the US close, orange solid lines show hedging into the Europe close, and dashed reversion after the Europe close). And while many macro fundamental narratives were presented to explain the price action the past week, Kolanovic continues to believe that "one of the main drivers of price action and market sentiment was these systematic flows." So where does this leave us now with technical flows, according to the JPM quant? As Kolanovic notes, given the rapid selloff yesterday, "the reverting feature of yesterday's option hedging impact should have a positive market impact today" with the ~3% rally in China stocks (FTSE China A50) overnight, itself the result of some vocal jawboning by both the PBOC and China's regulators who once again gave the all clear on stocks, "should improve overall risk sentiment. Finally, according to the JPM strategist, fundamental investors may also return as China’s efforts are likely to stabilize local markets, and should boost Emerging Markets equities. ... even as "option convexities may subside after today’s expiry." Please note that these are only technical (i.e., predictable) drivers, and in addition the market will be driven by other positive or negative developments and flows. For now, however, with the S&P up 0.8% this morning, he appears to be right. All eyes now turn to the European close and, of course, the last hour of US cash trading, when the risk weakness has emerged in recent weeks. Should it fail to materialize today, it will be safe to say that the systematic overhang, whether from vol-targeting funds or dynamic option hedging, is indeed finally over.